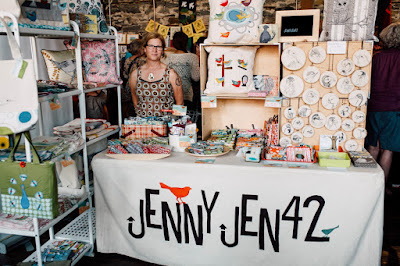 Jenny Jen42: Spring Craft Season...Here I Come!!!! Spring Craft Season...Here I Come!!!! What is your favorite Spring Craft Show you like to attend? What are you looking for when shopping for crafts during this time of the year? If its before Mother's Day, then most people have a mission. I've been feeling like spring craft shows can be a hit or miss depending on the crowd, the weather, the timing. Winter Holiday shopping is a major focus once we hit November, but even early fall shows can lack the motivation of many shoppers. Lots of Lookers become the phrase of the vendors along with the funny faces made at each other when a show has turned into a ghost town. I like to use spring for my trying out craft show time. I have made some horrible choices that I will not do again. Like one that took place in the neighborhood where I grew up, that was behind a strip mall on a grubby old parking lot. Won't tell you what we did there when I was a young lad! SO you learn your lesson and don't do shows because you are curious about your childhood memories! Through many years of trial and error I am hoping that this spring will not be a bust. I am confident and hopeful for a busy and productive spring! I will post shows as I (hopefully) get into them! Look for jennyjen in a new state this season...always a goal for me!